New monomers were synthesized and evaluated for their molecular imprinting performance by a recently discovered methodology referred to as one monomer molecularly imprinted polymers (OMNiMIPs). The structural design of the new monomers was based on a lead compound methacrylamidoethyl methacrylate (1) used for the synthesis of OMNiMIP1, and introduced alkyl groups of various sizes at the α-amino position of the lead compound. 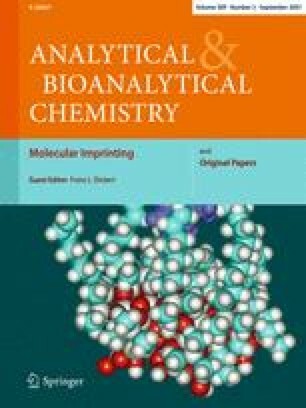 Enantioselectivity, determined by liquid chromatography, was used to compare the performance of the imprinted polymers. Methyl substitution provided crosslinker 5 (2-methacrylamidopropyl methacrylate), which upon imprint polymerization afforded OMNiMIP5 with approximately the same enantioselectivity (α = 3.8) as OMNiMP1 (α = 3.7) made with the lead compound (1). The other two monomers (6 and 7) with larger alkyl substitutions (isopropyl and sec-butyl respectively) resulted in OMNiMIPs with low selectivity values (α = 1.0 and 1.2 respectively). Last, a strong influence of diastereomeric complexes on OMNiMIP5 selectivity was determined, with L/L and D/D monomer/template pairs giving α values of 3.6–3.8, while L/D and D/L monomer/template pairs had α values of 2.3–2.4. There is no intrinsic enantioselectivity seen for the OMNiMIP5 control polymer made without template at all, giving an α value of 1.03. The online version of this article (doi: 10.1007/s00216-007-1364-2) contains supplementary material, which is available to authorized users. We would like to thank Alan Bussard for assistance with the porosimetry measurements. D.A.S. wishes to thank the National Science Foundation for CAREER Program award CHE-0134290.